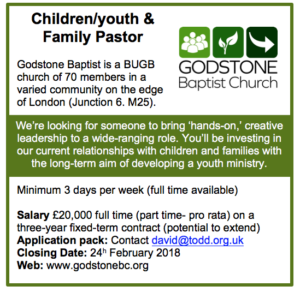 We’re looking for a Family Pastor (Children & Youth). For some time at Godstone we’ve been aware of a need to re-invest in our children, families and youth work. With many of our previous volunteer leaders moving into full-time ministry across the UK, we’re looking for fresh leadership within the children and families’ work that already takes place and ultimately feeds into any vibrant youth work. With this in mind, we’re looking for someone to bring leadership to this area (vision & strategy/ team building & inspiration/ servanthood & humility), initially on a three-year contract. Our first priority would be to encourage the good ministries we already have with children and parents in the church and community, and then to develop their untapped potential. Involvement with the local primary school. Our second priority is to begin work on creating new children’s and youth ministries within GBC. This will involve establishing the work with children and families mentioned above and ultimately the provision of youth work for those who move through and beyond our existing children’s work. We are very concerned that the new worker makes this role their own and has the freedom to be creative. We know this role needs someone who is enthusiastic not only to plan, but to actively work with children and families. While we do have a core of willing volunteers, initially the role will involve leading new and existing groups. We anticipate the role will require a minimum of three days per week up to a maximum of five. We are open to discuss availability and job shares. The deadline for applications is 24th February 2018. As you talk and pray about this opportunity, we pray that the Holy Spirit will ignite a sense of excitement and call about this vital ministry here at GBC.